Liquid Nitrogen Market size was more than USD 10 billion in 2017 and will witness 5.8% CAGR during the forecast timespan. Rapidly growing healthcare industry across the globe shall fuel the liquid nitrogen demand over the forecast period. Increasing electronics device applications in healthcare industry has led to increasing liquid nitrogen demand, as liquid nitrogen in healthcare industry is used to maintain low temperature. Product usage in the metal fabrication industry is increasing over the past few years. It used as a protection against corrosion and to prevent any additional heat generation. Positive outlook of the metal fabrication industry on account of robust industrialization and urbanization in Asia Pacific and the Middle East shall help the liquid nitrogen market to grow further in near future. Chemical & pharmaceutical was the largest end-user in 2017 and it is forecast to grow with a prominent CAGR. Liquid nitrogen is used in a chemical & pharmaceutical industry to cool reactors filled with catalyst. Rubber & plastic was another major end-user segment of the industry as liquid nitrogen in rubber manufacturing is used as a refrigerant in deflashing systems. Due to its ultracool temperature, it eliminates the need for pre-cooling and can quickly reduce the flash temperature, reducing cycle times and improving transportability. Ultracold, inert nitrogen can also help reduce heat produced in your grinding process, resulting in high-quality, very fine, uniformly sized particles. Automotive manufacturers are engaged in R&D to make liquid nitrogen compatible engines in order to curb vehicular carbon emissions. Any commercial product usage in the future across automobile industry will create an exponential demand in near future. Nitrogen engines will be environment friendly and will create a zero pollution as emissions from nitrogen engines will be air. However, hazards associated with the liquid nitrogen handling are likely to hamper its demand over the forecast timespan. Additionally, worker safety organizations may create strict regulations for liquid nitrogen manufacturing as many accident cases are registered at manufacturing plant due to tremendous pressure in enclosed space. On-site production accounted for the largest liquid nitrogen market share in 2017 as key end-user sectors requires bulk liquid nitrogen on daily operations. It is cost effective and environment friendly process, owing to which it shall grow with a highest CAGR during the forecast period. 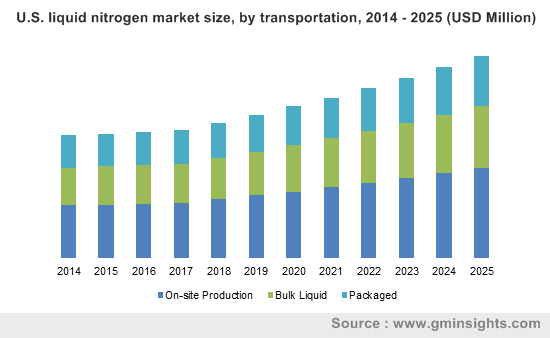 Bulk liquid nitrogen demand is anticipated to grow with a prominent CAGR in near future. It is the most effective transportation mode to supply liquid nitrogen across the region. However, increasing transportation prices may restrict the growth of this segment at some extent during the forecast period. Automotive and healthcare industry will have the highest CAGR in the market over the forecast period. Increasing usage of electronic devices in the healthcare industry has been propelling the market growth in the past few years. Moreover, increasing automobile manufacturing across the globe will subsequently drive industry growth. For instance, the global commercial and passenger vehicle manufacturing in 2009 was close to 65 million units and surpassed 95 million units in 2017. Europe has registered highest share in liquid nitrogen market in 2017 and generated revenue close to USD 2.6 billion in the same year. High product usage in the food & beverage was the major factor attributing product demand in the region. Liquid nitrogen is used for cooling and food preservation. In addition, gigantic chemical industry in the region have created the highest liquid nitrogen demand in the region from past few years. Product is used in the chemical industry to reduce the heat generated while chemical manufacturing. However, the region is expected to exhibit sluggish growth during the forecast timeframe owing to shift in the manufacturing facility towards regions with easy raw material availability and low labor cost. Asia Pacific shall experience the highest CAGR during the forecast timespan. This can be attributed to the rapidly growing end-use industries in the region, such as rubber & plastic, automotive, pharmaceutical and metal fabrication. For example, more than 60% of global automotive are manufactured in the Asia Pacific. Moreover, significantly growing pharmaceutical industry in India and China shall fuel the product demand over the forecast period. 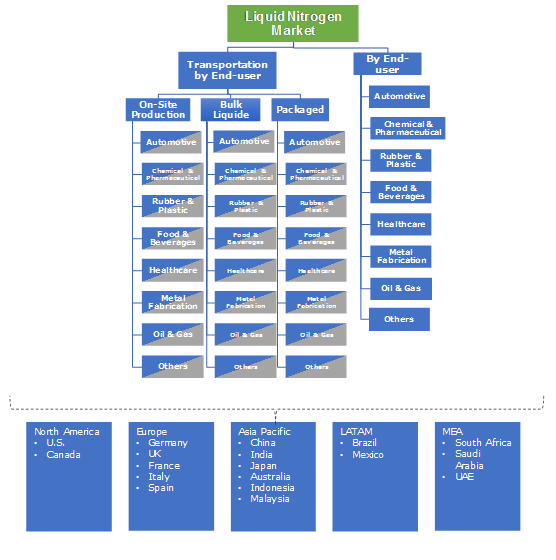 Liquid nitrogen market is highly diversified, many multinational giants, mid-scale and small-scale companies are operating in the market. This can be attributed to low capital requirement for the product manufacturing. 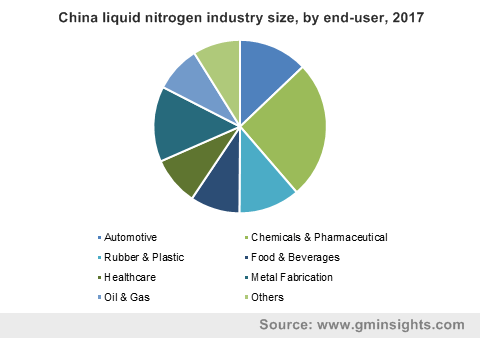 In addition, liquid nitrogen is used in a diverse range of end-use industries. Some major players operating in the industry includes, Linde Ag, Messer Group, Praxair Inc., Nexair LLC, Air Liquide S.A., Taiyo Nippon Sanso Corporation, Gulf Cryo, Air Products and Chemicals Inc., Sothern Industrial Gas Berhad and Emirates Industrial Gas Co. LLC. Key companies are engaged in strategic mergers and acquisitions in order to expand their market share. For instance, In May 2016, Air Liquide completed the acquisition of Airgas Inc., one of the leading industrial gases & associated products and services supplier in U.S. This acquisition is likely to increase the company’s customer base in North America in industrial gases and liquid nitrogen market. Liquid nitrogen is inert, colorless, odorless, non-corrosive, nonflammable, and extremely cold. Environment protection and safety associations has provided safety measure to liquid nitrogen application. It is used to preserve biological samples. Strong growth indicators in automotive, food & beverage, chemicals and pharmaceutical sector will propel the market size over the forecast timeframe.